Exceptional Whitetail Deer Hunting & World-Class Breeding Program. Mustang Creek Ranch™ is located in Salado, Texas. We have been dedicated to improving White-Tail Genetics since 1992. We are passionate in our drive to improve the genetic potential of Whitetail Deer in Texas and preserving the beauty and natural diversity of Mustang Creek Ranch™. We honor the tradition of hunting and love to share the joy of experiencing this jewel of Central Texas. In 1994, Dr. James Kroll (a.k.a. “Dr. Deer”) agreed to become our head biologist, and since has not only become one of our strongest supporters, but a dear and trusted friend. As founder and current director of the Institute for White-tailed Deer Management and Research for The College of Forestry at Stephen F. Austin State University, Dr. Kroll has been a pioneer in the field of Artificial Insemination of the species. His credentials, his tremendous experience, his pioneering research and unsurpassed work ethic have been the backbone of our Scientific Breeder Program. We are proud and pleased to be offering the product of this amazing partnership and as such the privilege to hold the exclusive endorsement: “Recommended by ‘Dr. Deer’”! 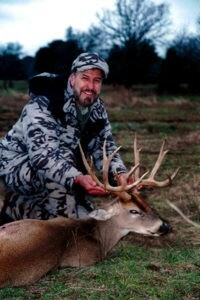 Due to the desire and commitment to enrich white-tail genetics, Bill Grace, together with several of the leading breeders in Texas founded the Texas Deer Association in 1999. These gentlemen have contributed greatly to the development of the deer industry and to the tireless protection of land owner’s rights in Texas. Mustang Creek Ranch™ remains active in this organization as Bill maintains Emeritus status on the Board. Support this organization as it makes great strides to protect YOUR rights as a deer breeder and land owner. Mustang Creek Ranch™ has been a proud member of Texas Trophy Hunter’s Association since 1994. 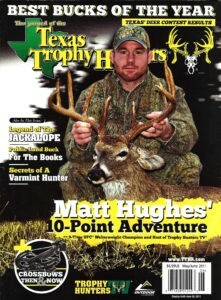 TTHA promotes the sport, science and heritage of hunting. Mustang Creek Ranch™ has been privileged to be have been the feature front covers for various issues of Texas Trophy Hunter’s Magazine.